moving in its dream world state. the last time she would see her face. of how the tree will look, what they will eat. too late the treacherous rift. the mountain broods, another song to sing. Lilian was my great-grandmother. 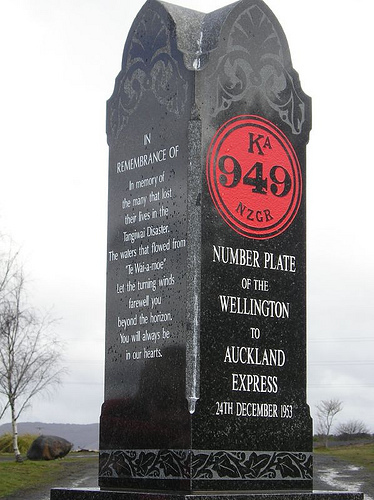 On Christmas Eve, 1953, she and her son Gordon were going up to Auckland by train to have Christmas with her daughter. That night, a section of the wall around Mount Ruapehu’s crater lake had broken away, and millions of cubic metres of water rushed down the mountain, into the Whangaehue River. It damaged the bridge at Tangiwai before the express train reached it. One man, Cyril Ellis, ran waving his torch to stop the train, but before the driver could fully brake, three carriages plunged into the flooded and silt laden waters. 151 people died. My Mum remembers early on Christmas morning there was a knock on the door, and policemen were there to tell her father his mother Lilian and brother Gordon had died at Tangiwai. Grandad went with the police and travelled to Tangiwai to identify them. Lilian was the last person to be recovered. She had been swept fifty kilometers down the river to the sea. Lilian’s ring is over 100 years old now (she was married in 1902). The large diamond in it is actually made of cut glass, because she eloped to be married and they didn’t have money for a diamond. On Christmas Eve l wear the ring to remember her.